Even if most of the people now use mobile phones, desktops still have considerable users. Many people still prefer large screen for most of the tasks. Most of the people who own Mac prefer iPhone. It is because MacOS and iOS are deeply integrated to give you good feature and easy sync. However, Android is also a nice platform with a huge list of apps. If you do not have an Android phone and use Mac, you can still try Android apps on your Mac. In this article, I will show you how to try Android apps on MacOS for free. First of all, you need to download Android emulator on your Mac. VirtualBox and BlueStacks few popular Android Emulators. You can also check this list of best Android emulators. 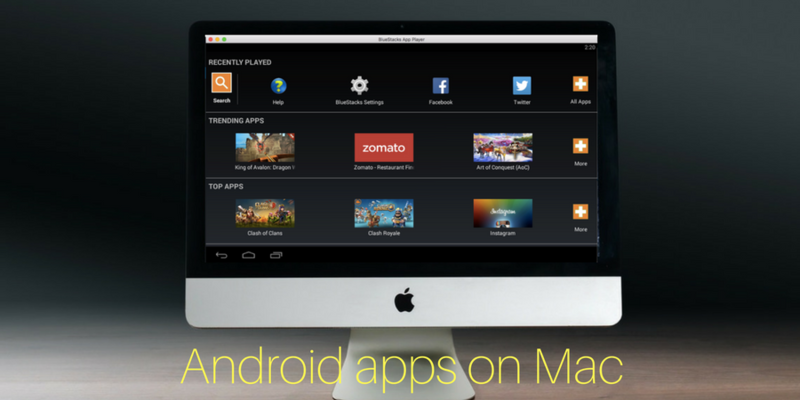 In this article, I will use Bluestacks to show how to run Android apps on Mac. Bluestacks come with Amazon App store to install apps and try. For this, you need to connect your Amazon account. It also comes with few pre-installed apps to try. On the home screen, you can see trending apps, top apps and apps by different categories. Click on any app to install. You need to connect your Google account to install apps. Different actions will not be as fast as you perform on an Android phone. So, you need wait extra for installation and sometimes for the response of an action. Apps install in the same way it installs in an Android phone. After installation, you can run the app and enjoy. I sometimes use Bluestacks on my Mac to play Android games. Apps are optimised for a phone screen. So, it will run vertically on Bluestacks. You can try any kind of app and see how it works on your MacBook. I tested several apps and it is fine. Try using any interesting app or game on your MacBook. In case you need any help, you can always leave a comment.